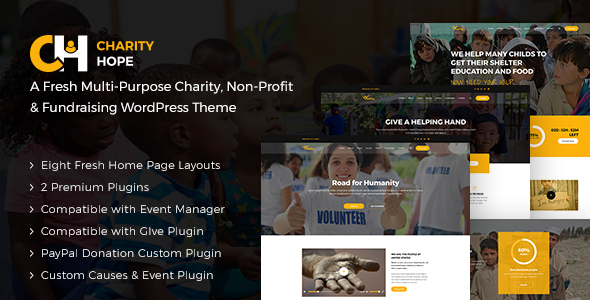 Charity Hope is a Modern & Fresh WordPress Theme for Charity, Non-Profit, Fundraising & Crowdfunding Organization. It is best suited for Non-Profit Organization. It comes with 8 Beautiful Homepage, Causes, Event & All necessary Pages. iCharity is Built with Visual Composer Drag&Drop Page Builder, Bootstrap, HTML5 & CSS3. Theme Options Powered by Live WordPress Customizer. The layout looks beautiful at any size, be it a laptop screen, iPad, iPhone, Android Mobile or tablets. Plus, anyone can update with his need using drag and drop Page Builder.